Ushering in a new era of reliable data logging and RF communication capabilities, Texas Instruments Incorporated today announced the industry's first ultra-low-power ferroelectric random access memory (FRAM) 16-bit microcontrollers. 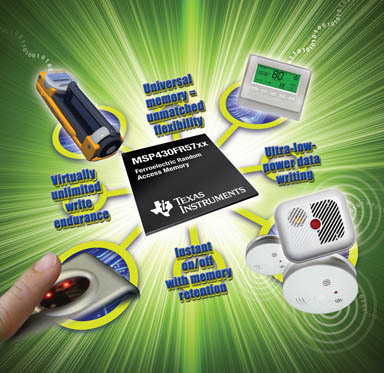 Further demonstrating TI's embedded processing leadership, the new MSP430FR57xx FRAM series ensures data can be written more than 100 times faster and uses as little as 250 times less power than flash- and EEPROM-based microcontrollers. Additionally, the on-chip FRAM allows data retention in all power modes, supports more than 100 trillion write cycles, and delivers a new dimension of flexibility by allowing developers to partition data and programming memory with changes in software. The FR57xx series eliminates existing power consumption and write endurance barriers, enabling developers to make the world smarter with more cost-efficient data logging, remote sensing and wireless update capabilities in new products that do more and last longer. The new MSP430FR57xx microcontrollers start at $1.20 at 10K units, the MSP-EXP430FR5739 Experimenter's Kit is $29, MSP-TS430RHA40A Development Kit is $99, samples and tools are immediately available. The MSP-FET430U40A includes a target board that accepts any MSP430FR57xx device in the 40-pin QFN package. It breaks out the pins for easy access. In addition, this bundle also includes a Flash Emulation Tool that connects your target board to a PC via USB.